It’s not my first rodeo or my first visit to Melbourne, in fact, it’s my fourth visit in the last 18 months! 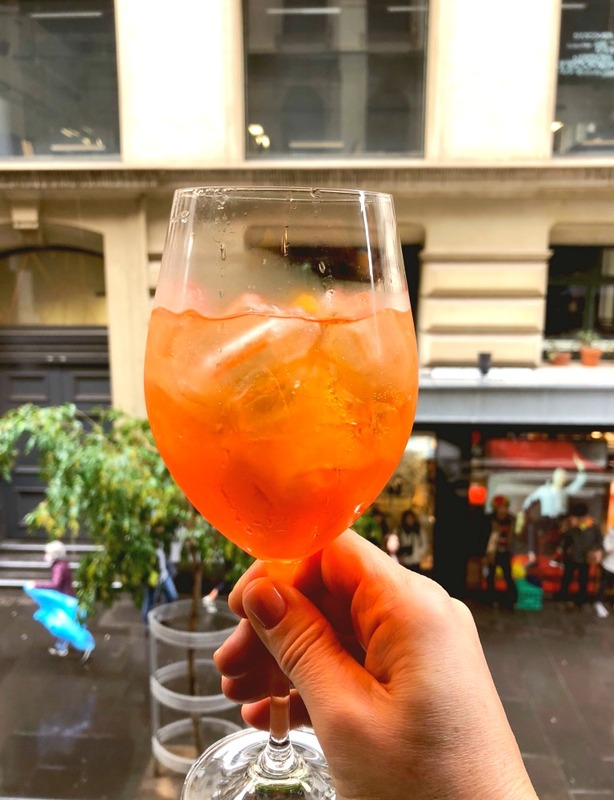 Last year, we had a fun 48 hours celebrating our double digit wedding anniversary, then I was flying solo for the Bupa Blog Awards and in March, me and my friend Joan, had an another action packed 48 hours when Joan popped her Melbourne cherry. This time I have a whole 72 hours to play with – that means more time, more food and more frolics. I think you’ll be amazed at how much we fit in! Coincidentally, my Airbnb is next door to where I stayed last time I was in Melbourne but this place is next level! Donna, my host is an architect and her eye for design is evident just about everywhere. I am sure if I look hard enough I can see right in to the Lord Mayor’s Office in Town Hall! Donna really is the host with the mostest and has thought of everything. She’s left guidebooks, Myki cards and has stocked the kitchen with heaps of basic essentials, plus croissants, juice, milk and even chocolate! 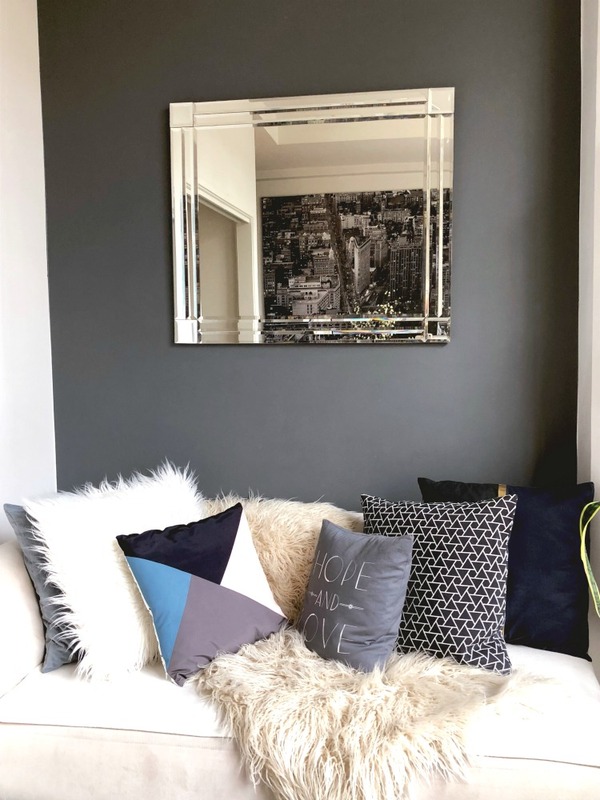 Here are my top tips for picking the perfect Airbnb. If you’re new to Airbnb, click my referral link here and you’ll score $55 credit off your first stay! As if that wasn’t welcoming enough after I’ve dumped my bags, Donna takes me on a tour of the local lanes and shows me all the hidden gems on my doorstep so that I can really live like a local. 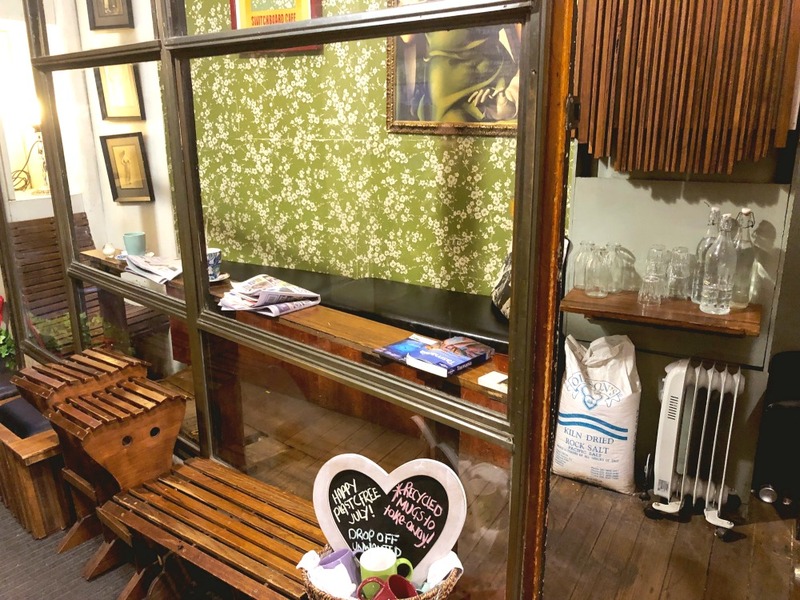 One such treasure is the teeny tiny Switchboard cafe – the smallest coffee spot in town. Nestled at the back of the Manchester Unity Arcade this is literally a hole in the wall. 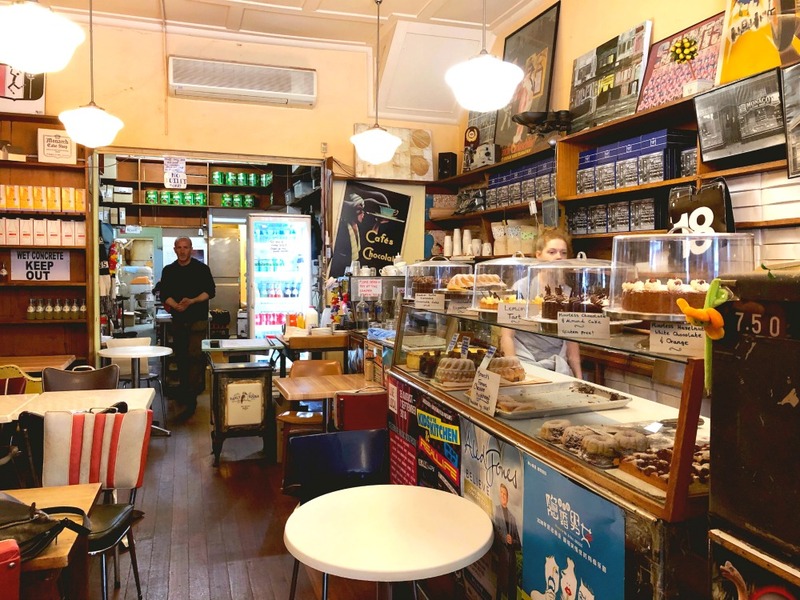 This place serves great coffee, fresh cakes and a delicious range of toasties which can be enjoyed on the little wooden stools in the alley, to go or my personal favourite, in the display cabinet! I waste no time in seeing and eating Melbourne and hot foot it to meet my friend Lauren at this mecca of baked goods. We actually want to have high tea here but reservations are essential and they get booked out months in advance and we totally miss the boat. 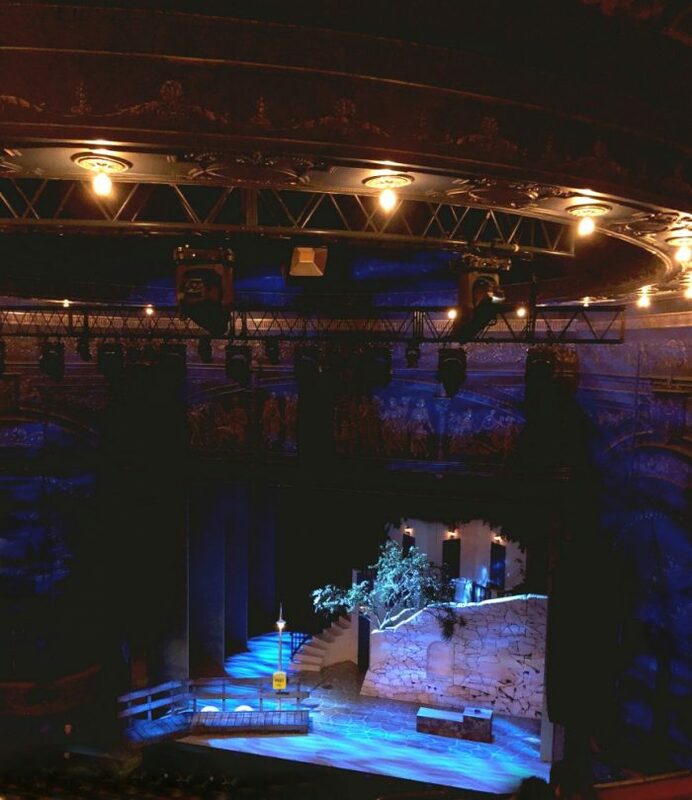 Still, it must be our lucky day because there is hardly a queue and we are seated almost immediately. Incidentally, don’t let the queue put you off because it moves quickly and this is one experience you won’t want to miss. 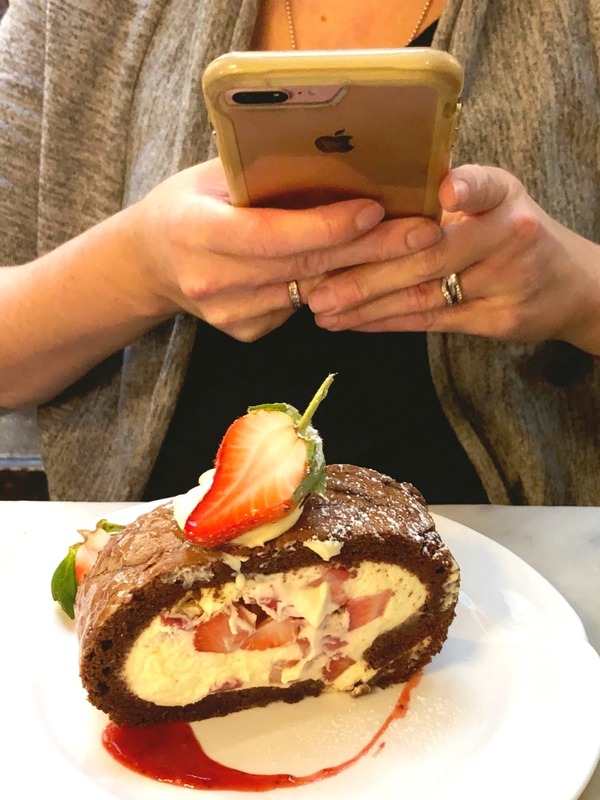 Friends who love cake and take photos of food are my kindred spirits. After a rest, it’s time to refuel at Shandong Mama Mini. 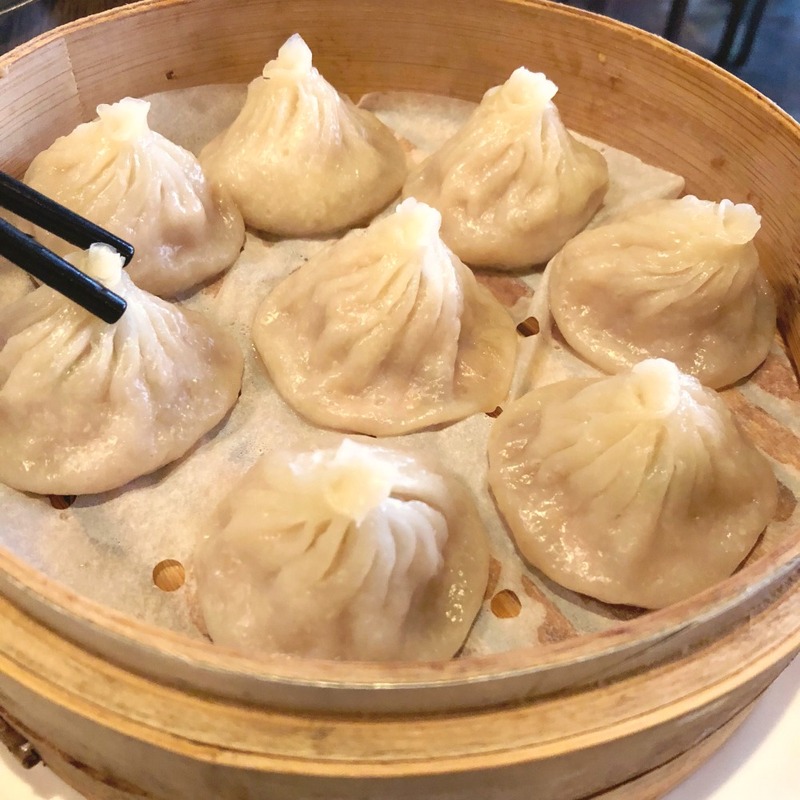 My friend Rochelle took me to the original Shandong Mama in Bourke Street when I was here in November and I’ve been craving their dumplings ever since. I love this bijou version of the original “Mama” – it may be small but it’s perfectly formed. The only problem I have dining alone is that I can’t try as many menu items as I would like so after much deliberation, I settle on the Melbourne dumplings because when in Melbourne and all that. I just can’t get enough of the pot-stickery goodness. The dumplings tick all the boxes; they’re quick, filling and totally delicious. Melbourne is such an entertainment hub and with so many shows on offer, I can’t resist nabbing a last minute ticket. There’s is a half price ticket booth on Swanston Street where you can score some serious bargains but they don’t have availability for all shows on all days. That’s the case for Mama Mia so I hot foot it to the Princess Theatre where I pay full price for the cheapest ticket and have a half a row to myself! I first saw Mama Mia when it came out in London many moons ago, but I love this Australian production just as much, if not more! Encore! This former newspaper stand has been transformed into a bijou creperie and it’s like a little slice of Paris on the streets of Melbourne. The kiosk is located almost outside my Airbnb and quite frankly, it’s proving impossible to resist. I figure it’s been a long time since dinner and as clapping counts as cardio, so I definitely need a crepe. So does everyone else if the queue is anything to go by! 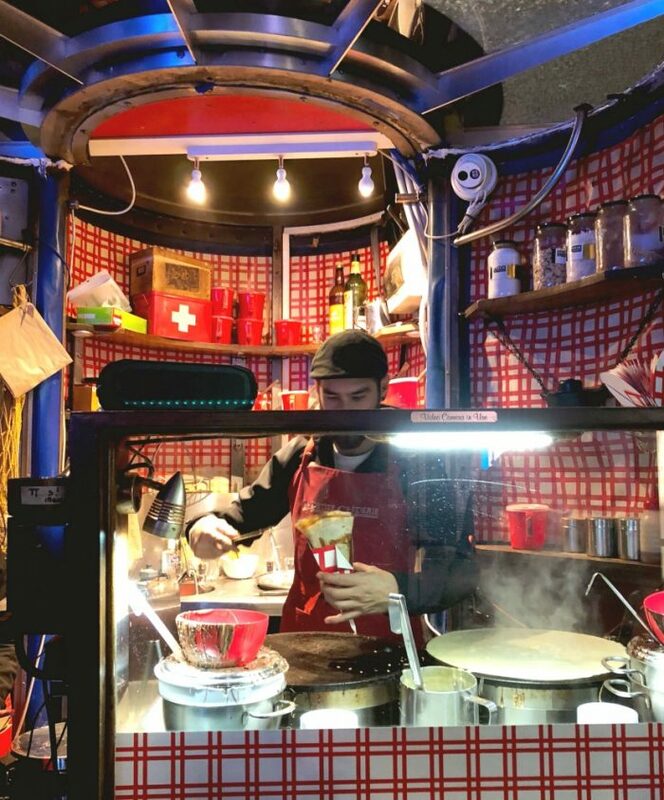 Still, this guy is a crepe magician and works so fast that I don’t have to wait long. In fact, see that crepe cooking right there? That’s mine and is soon to be topped with homemade salted caramel sauce. C’est magnifique! I’ve been itching to get back here since my friend Lauren from Create Bake Make brought me here a few days ago, it’s a cake and dessert lover’s dream! Until now, I have had neither the time nor the stomach space. With so much to choose from, it’s seriously hard to make a decision, but finally I settle on this Bigne San Giuseppe (AKA Italian Cream Puff) because it’s small, and anything with a hint of doughnut gets my vote. The coffee is good too. At the weekend this place can get seriously busy but at this time of the morning, the light, stylish space has a gentle buzz about it. Although, there is a full lunch and dinner menu, the cakes and desserts are where it’s at, and if you don’t want to eat them, it’s worth coming just for a look. They’re mind bogglingly good and if you don’t believe me, check out this Tiramisu cake! 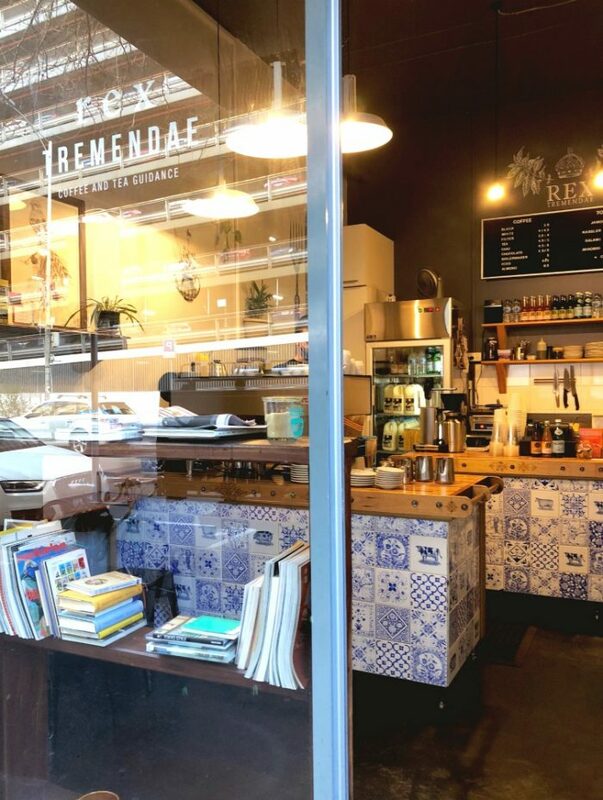 As luck would have it, Judy, my dumpling partner-in-crime from Sydney is also in Melbourne and also spending the weekend with her husband (who incidentally is also called Dave,) so we catch up on coffee and other coincidences at Rex Tremendae. 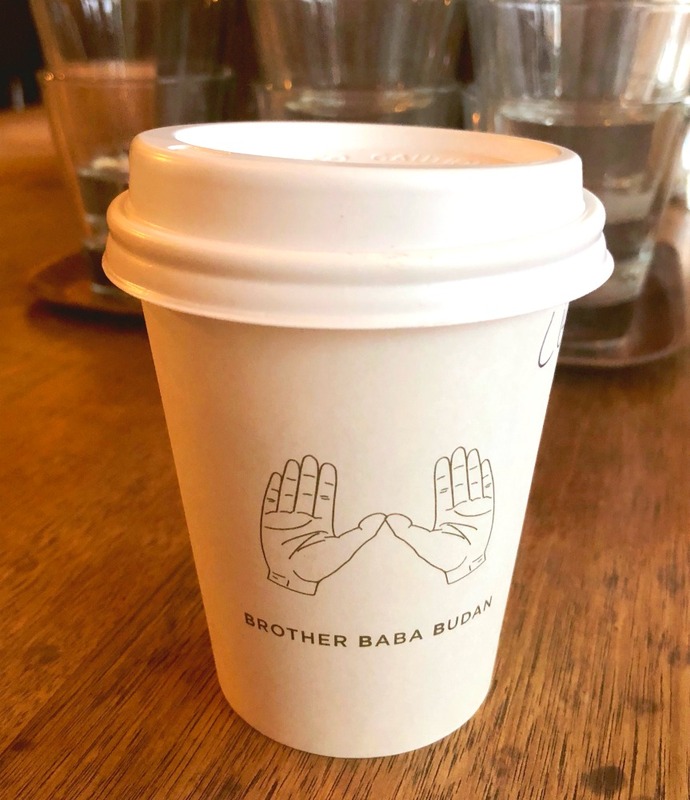 I have to admit, sometimes I pick my coffee places the way I pick my wines and that is by choosing the ones with the cool names. 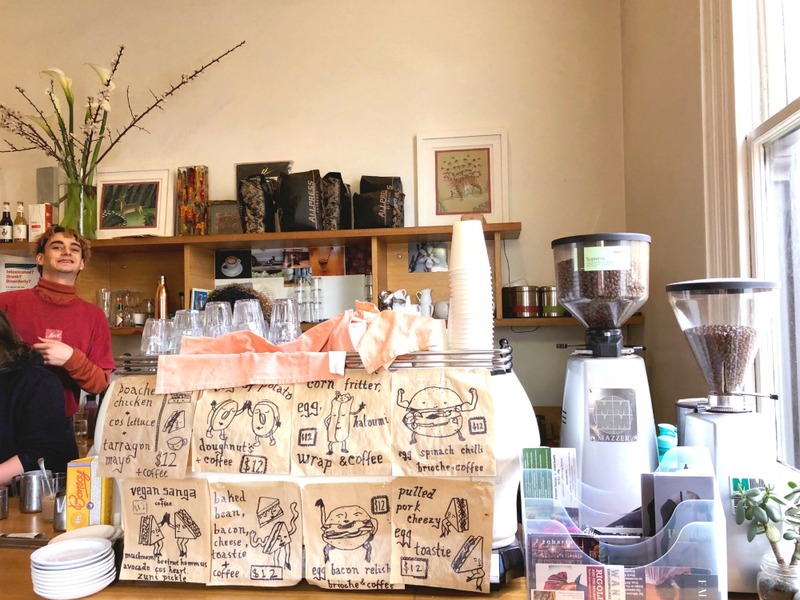 To be honest, I don’t even know how you pronounce Rex Tremendae but I do know that this bijou cafe has fabulous coffee and super friendly staff. It’s a fresh morning but we live dangerously and sit outside with some bench blankies to keep us warm. The eagle has landed, or rather David has. He jumps aboard the Skybus – there’s no train link to Melbourne’s airport – which has to be the easiest, most efficient and most economical way to hot foot it into town. He arrives at Southern Cross Station in record time – the weekend starts here. I rarely go back to the same place twice when I travel but I simply cannot visit Melbourne without visiting Miznon. The food here is fresh, fast and crazy good. 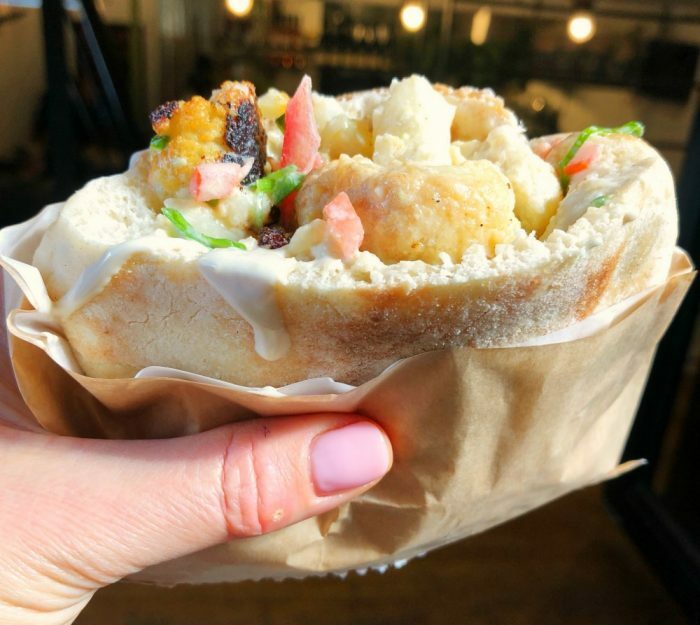 David goes for the Cheeky Pita with falafel, tomato steak, chilli, onion and pickles but I have my usual, the White; cauliflower, tahini, tomato salsa, chilli and spring onion. It’s as good as I remember, only better. It’s only after we leave that I realise that they’re open for dinner and Saturday brunch too. I’m not overly pleased about missing out but that’s something to look forward to for next time. We jump on a tram to Fitzroy, I’m keen to explore this edgy, eclectic suburb – it’s been way too long in between visits. As we walk along Smith Street, we pass Gelato Messina and I can’t not go in because you know how I feel about ice cream and you can multiply that feeling ten fold for the way I feel about Messina. I think this is the biggest Messina I have ever been to – apart from that one time I went to their factory – and the space is bright and airy. There are more flavours than you can shake a stick at, a selection of mind bogglingly creative cakes and you can even see the chef creating gelato magic. 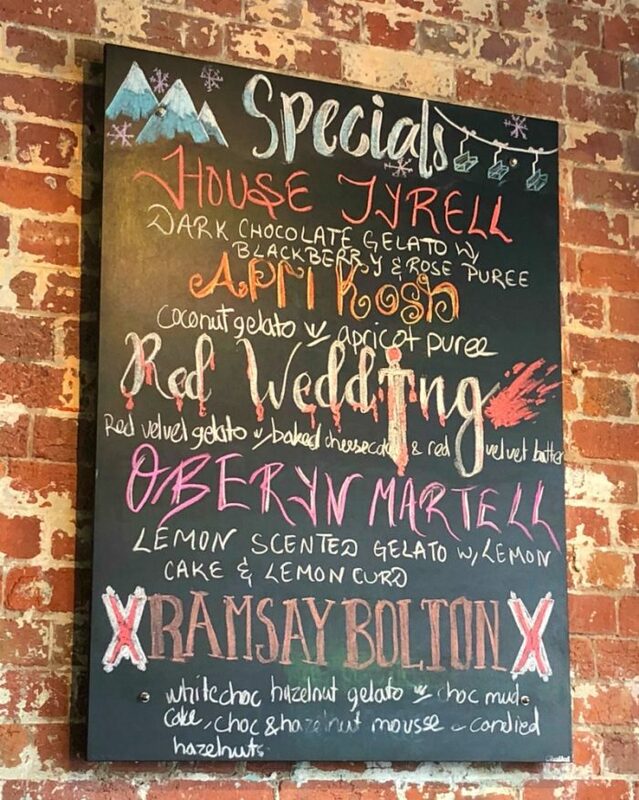 I have the best intentions to look and not buy but then I see the Game of Thrones inspired specials and cannot resist the Red Wedding; red velvet gelato with baked cheesecake and red velvet batter – it’s a limited edition after all. It’s also a very delicious edition! David does not share my enthusiasm for gelato, he’s more keen on coffee and so we head to Proud Mary for some quality caffeine. We’re way too full to eat which is a shame because we’re eyeing off our neighbour’s lunch and it looks outstanding. Still, the coffee totally hits the spot and the service and cool, spacious setting is totally on point. I’m more excited that a kid at Christmas about this pop up museum for sweet lovers. 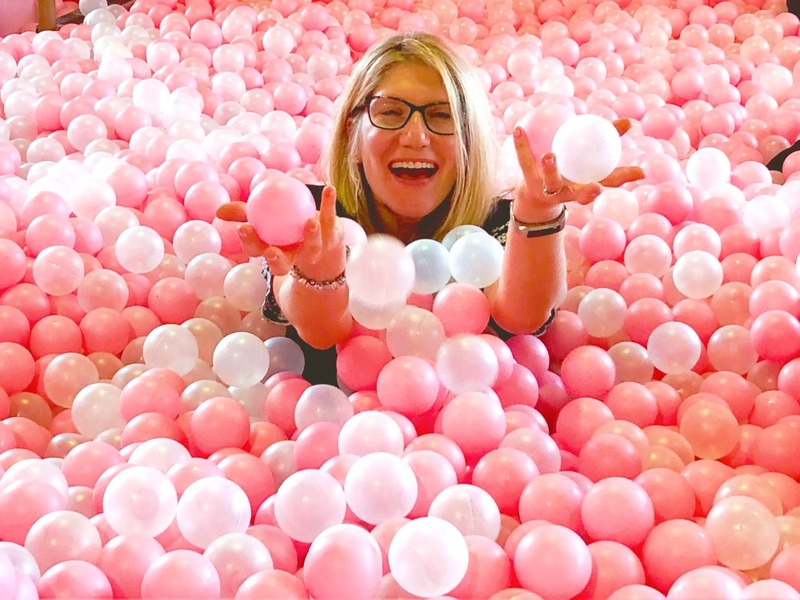 There’s sweets and treats and all kinds of interactive exhibits – including a grown-up ball pit, a wheel o’treats and a gum ball machine that you can climb inside! For realz! Our visit is perfectly timed because Sugar Republic Melbourne is about to shut up shop but it’s coming to other Australian cities soon, so stay tuned. 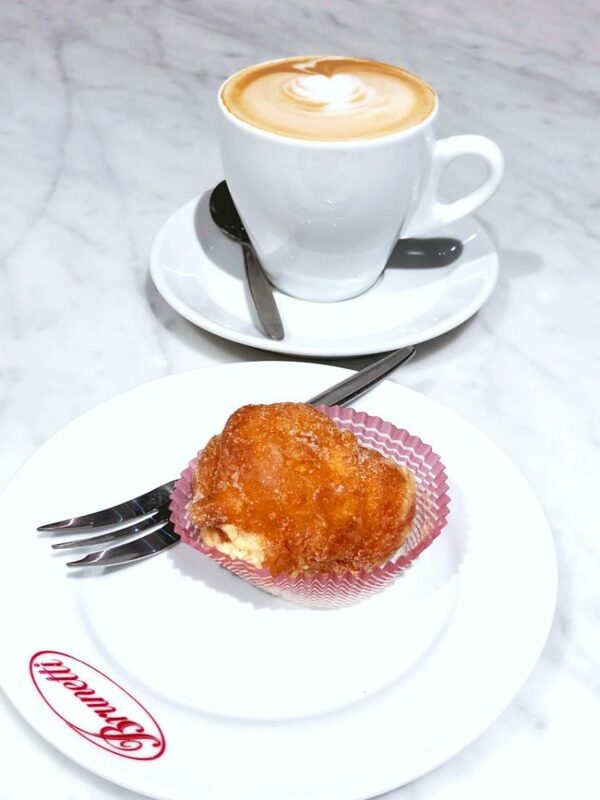 In the meantime, you can find out about our favourite Sugar Republic sweet spots here. We wander round the neighbourhood, checking out the street art, vintage stores and delicious eateries. We have a lot of fun retracing our steps and finding the bars and restaurants we visited on previous visits. All this walking is thirsty work and we seek liquid refreshment. Most of the bars here don’t open until 5pm so we hop back on a tram to the CBD to quench our thirst. 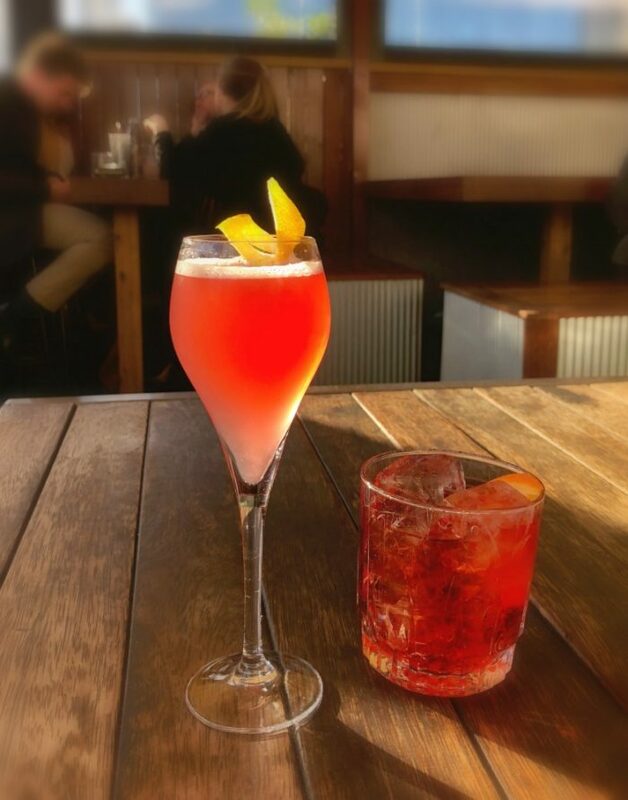 We feel as though it would be rude not to make the most of the winter sunshine so we head to Goldilocks Bar. 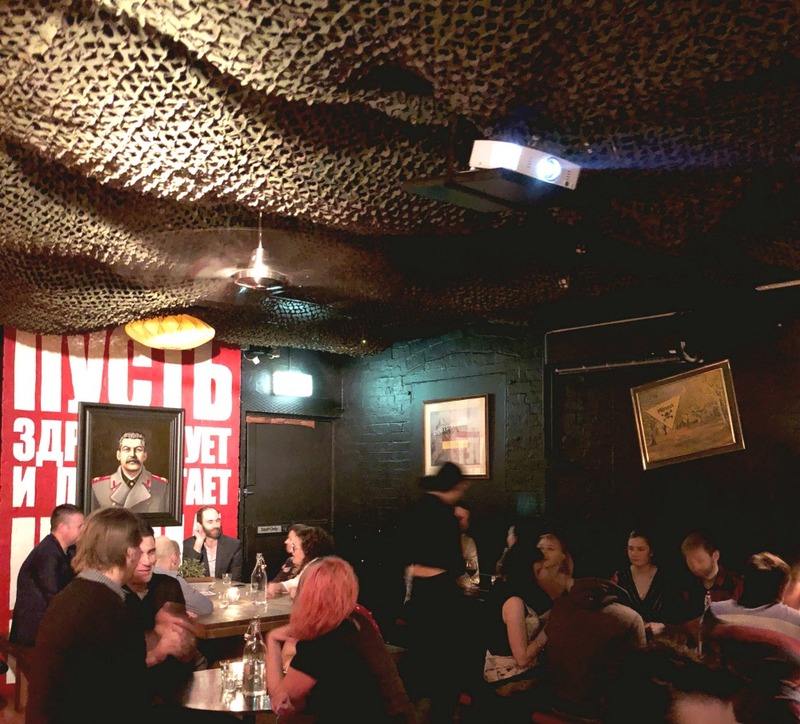 Finding this speakeasy is a bit like a treasure hunt, because it’s hidden behind an emergency stairwell and then behind closed doors, but like the Three Bears’ House, well worth seeking out. 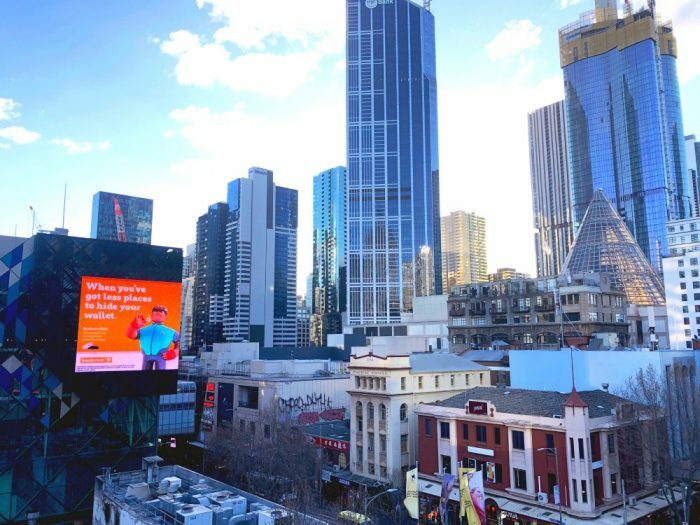 The views of the city from the rooftop are fabulous as are the drinks – beer and the cocktails are the specialities here. I’m sure if Goldilocks found herself at this bar, she’d find it just right! 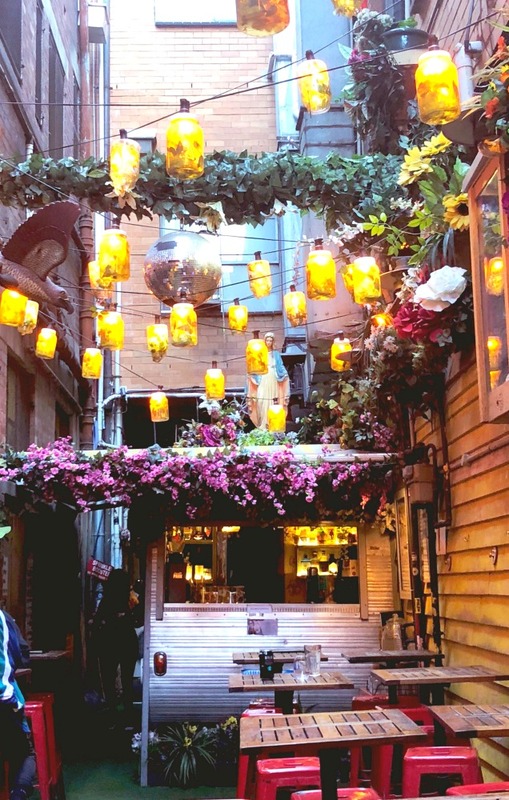 In this trendy laneway, you’ll find faux grass, hanging lanterns, cool art and drinks served from a vintage caravan at the rear. It’s fun and quirky although it’s open to the elements so we’re pleased that the weather gods are looking favourably upon us! We decide to save the best of our little bar crawl to last! This walk-in, standing room only bar is small but perfectly formed and is literally around the corner from where we’re staying. Praise be to Donna for point out this Melbourne treasure to me on my introductory tour because this is one place I wouldn’t want to miss. 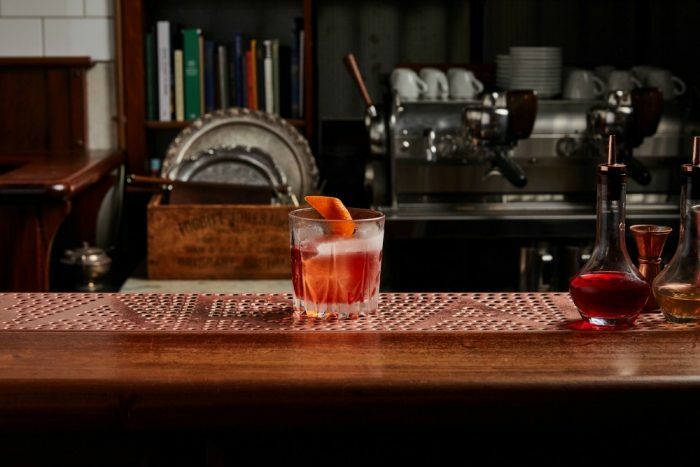 The cocktail list is as classic as the surrounds – the drinks here are very, very good and very, very strong. You won’t find any fruity, sugary drinks here – the cocktails here are the real deal. The drink selection changes every week according to seasonality and the bartenders’ whim but if you’re not sure what to choose, the friendly bartender will be happy to advise. Failing that, there’s always espresso. And heads up, this place is no cash (card only,) and no photos! When we travel, we usually take turns choosing things to see, do and eat. Tonight it’s David’s turn to choose and not surprisingly he’s chosen burgers, they’re his favourite. 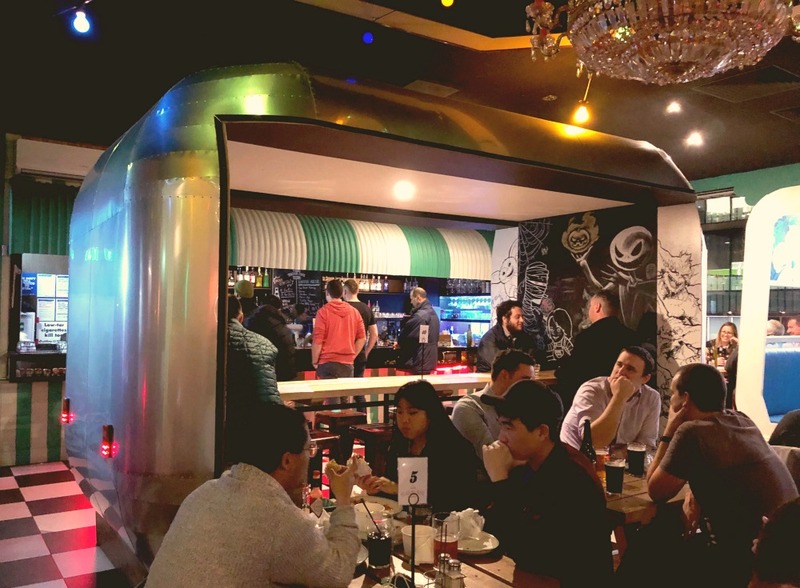 We’ve passed this place so many times and it looks like nothing from the outside but the inside it’s a revelation – it’s busy, it’s buzzing, it’s burgerlicious and there’s booths, lots of them with retro decor and vintage caravans. Despite the relatively early hour, the place is packed and we’re lucky to score a table at all – note to self, make a reservation if you want to sit in the cool seats! 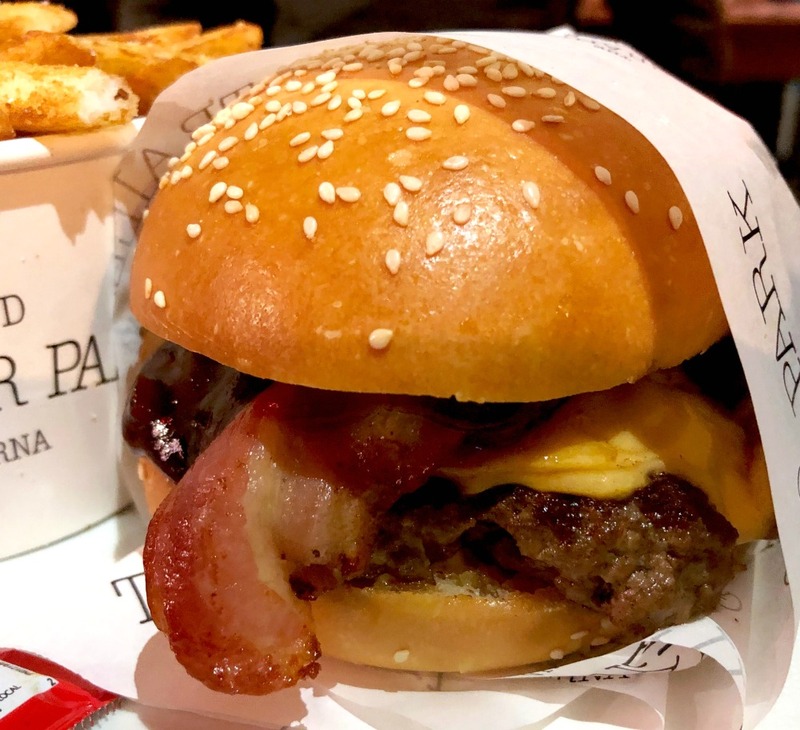 There’s a range of delicious burgers which are all beef patties although a chickpea pattie can be added to any of the menu items for a veggo option. Do arrive hungry and do order the beer battered chips, they are soooo good. We’re all set to pass on dessert until I spot the oreo beignets on the dessert menu. Me and those oreo beignets – we’re meant to be together. We agree to share and just try one each, but I’m telling you, once you start eating these hot donuty bites with a rich Oreo centre, you just can’t stop. Well we can’t anyway. We roll ourselves home and spend the rest of the evening in a food coma. It’s been years since I was last in St Kilda, in daylight at least! If you’re counting evening functions, I was hanging out here in November for the Bupa Blog Awards. Oh what a night! We catch the tram to St Kilda and head straight for Miss Jackson. Tucked away on a small side street, you could easily mistake this place for a house, save for the small blackboard sign outside. Inside the Victorian building, there’s a number of light, airy rooms, a super relaxed vibe, friendly staff and an epically eclectic breakfast/brunch menu. It is so hard to choose because I literally want to try Every. Single. Thing. To be honest, trying one thing is challenge enough because portions here are very generous indeed. 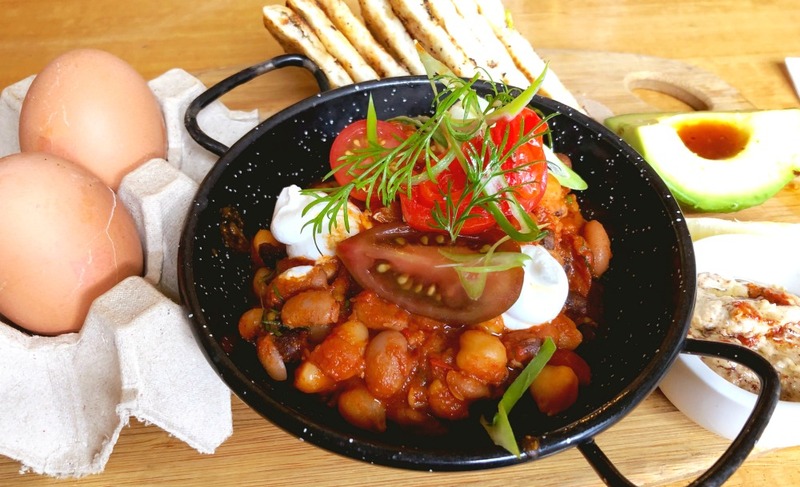 In the end I settle for the Egyptian breakfast beans, soft boiled eggs, feta, baby mushrooms, baba ganoush, avo and flat bread. It’s epic! 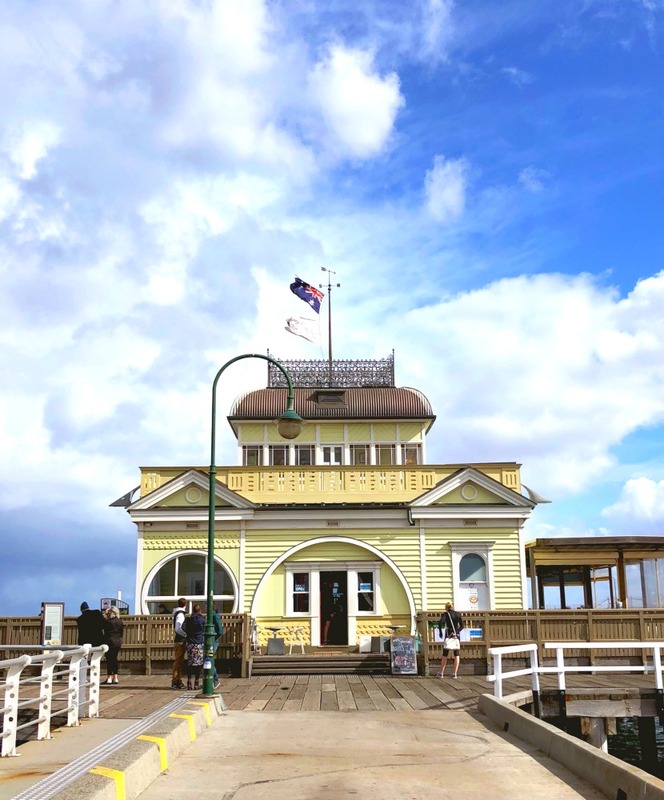 We really need to walk off our enormo-breakfast so take a stroll along the historic St Kilda Pier and brave the wind for the panoramic city views. The kiosk burnt down in 2003 just a year shy of it’s centenary but was lovingly restored in 2006 – it’s a cafe now. 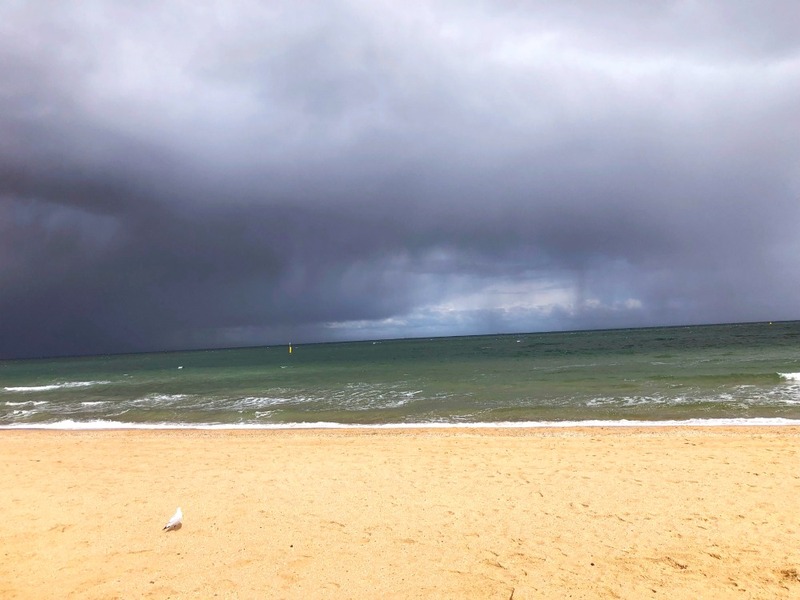 We continue walking along St Kilda Beach – in summer you’ll be hard pressed to find a free patch of sand but today there’s a storm a-coming so we have the whole beach to ourselves… Apart from one lonely seagull! 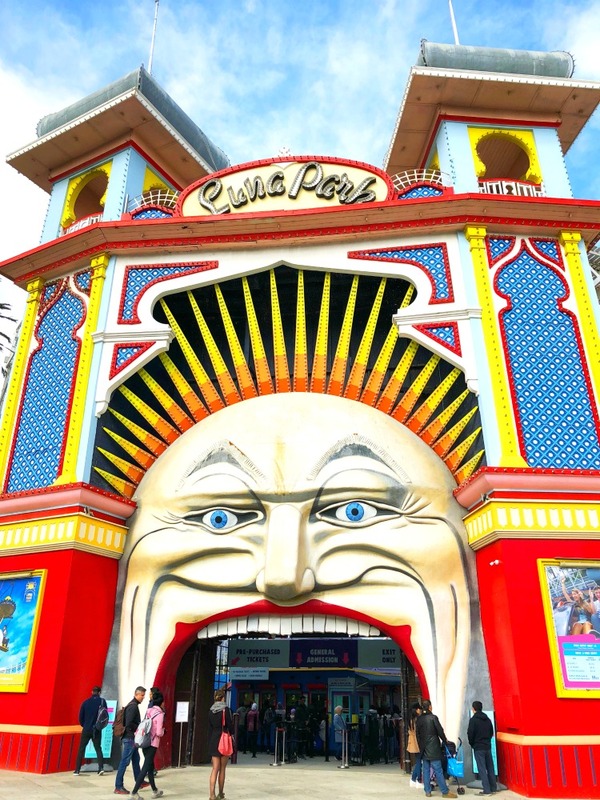 As we cross the road to Luna Park, I can’t help thinking that Mr Moon is so much more scary-looking than his Sydney counterpart. Unlike the Sydney park, you have to pay to enter which is a shame because I would have loved to check out the baroque carousel, I hear it’s beautiful. The park is modelled on the original Luna Park in Coney Island is also home to a historic rollercoaster, which built in 1912, is the only rollercoaster operating from that period. Usually you can hear the screams from the Scenic Railway before you see it, but not today, as it is undergoing some off-season maintenance. 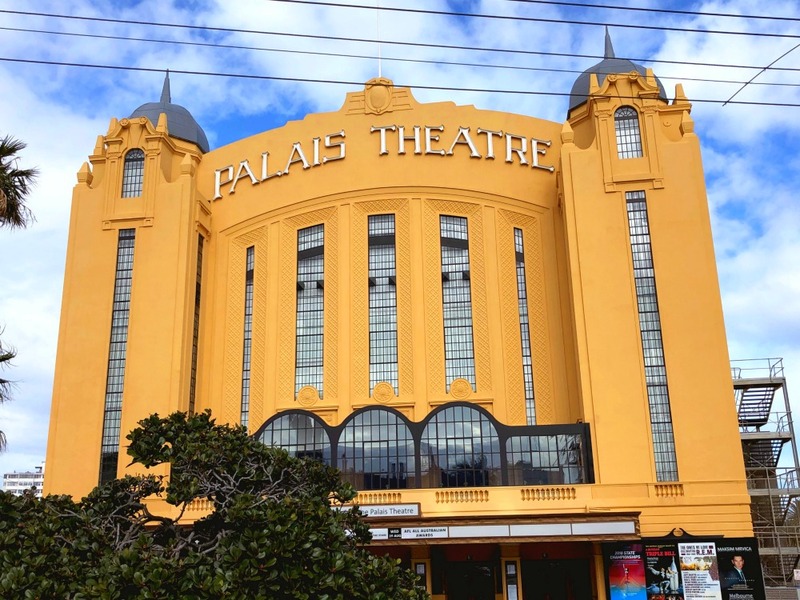 Then we head to the Palais Theatre a mighty fine example of Art Deco if ever there was one. This former cinema turned concert venue has hosted everything from ballet to bands and is really a sight to behold. I am a woman on a mission for cheesecake. 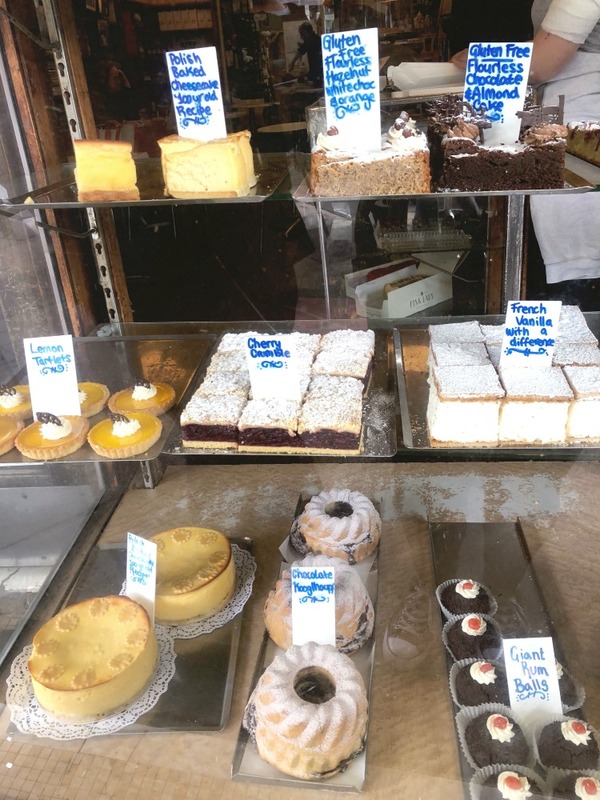 We take a stroll up Acland Street and even though we’ve just had breakfast, gaze longingly at the mouth-watering displays in the many cake shops. 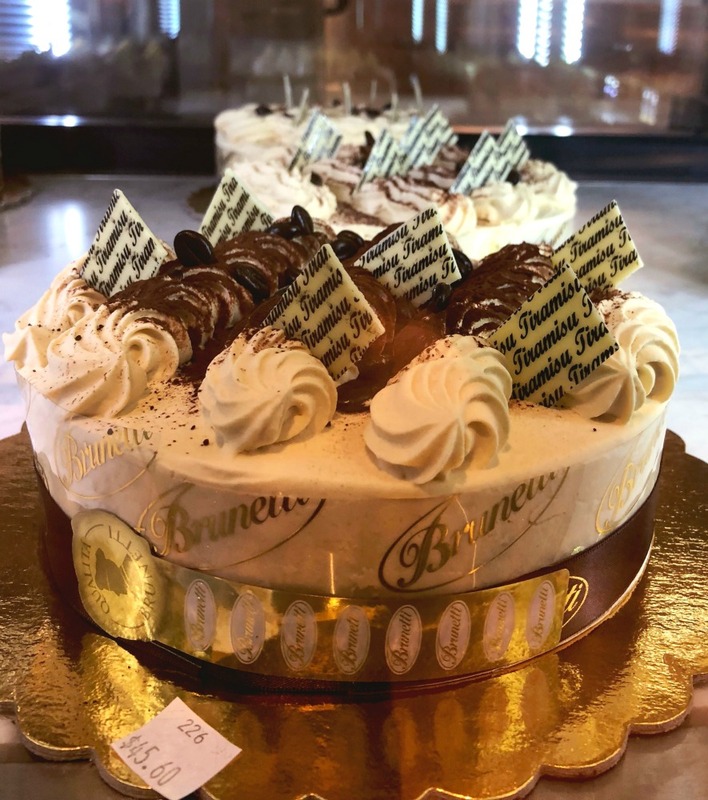 We’re headed to Monarch and while I can’t say if it’s the best cake shop on the strip, it’s certainly one of the oldest, baking deliciousness since 1934. Stepping inside the shop is like taking a step back in time, it seems as though the interior is as unchanged as the recipes. There’s seating inside and coffee but we decide grab our cake and go. Most of the recipes, like my family, come from Eastern Europe so I feel genetically pre-disposed to wanting everything. I settle however on the Polish Cheesecake, which has been made the same way since the 1920’s, and is impossible to resist. After a power nap and a slice of cheesecake, we head to the NGV for the MoMA Exhibition – 130 years worth of Modern and Contemporary Art from the Museum of Modern Art in New York. We totally underestimate the crowd pulling magnitude of this because the gallery is packed and the queues for tickets are so long they’re making me feel a bit queasy. Note to self: Book tickets in advance to avoid disappointment. 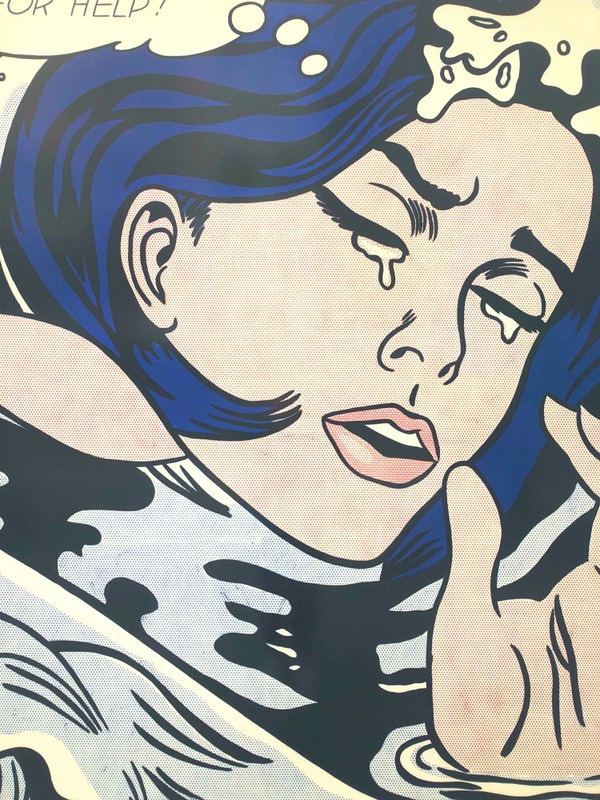 There are some pretty impressive MoMA replicas around the city promoting the exhibition, this replica of Roy Lichtenstein’s Drowning Girl is about as close as I’m going to get to the real thing. We turn our frowns upside down at the Ian Potter Centre where we enjoy the free exhibits and I can revisit one of my favourite exhibitions, the confronting but enlightening Colony Frontier Wars. It’s as good as I remember. 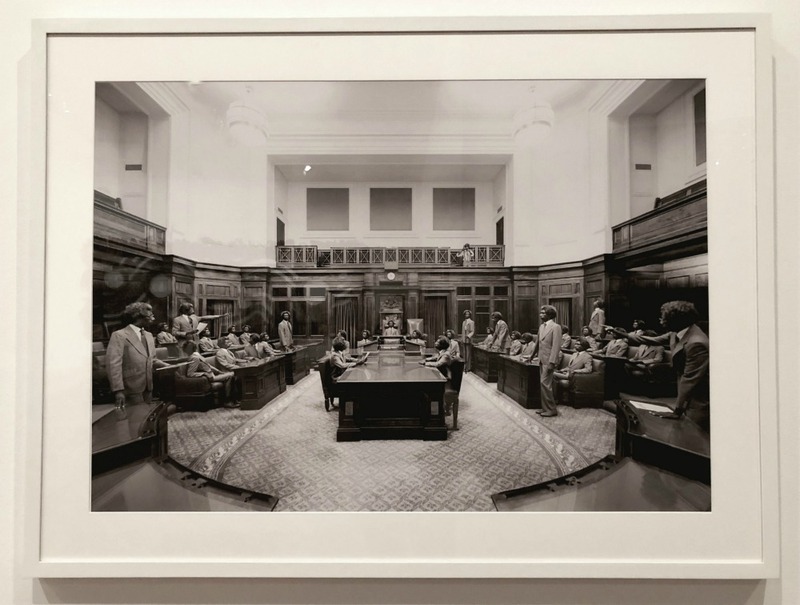 Michael Cook’s Series Majority Rule is one of my favourite pieces where the artist asks the viewer to think about an Australia where Aborigines make up the majority of the population and paints a picture of a societal structure that’s reversed. The series is a stark and confronting reminder of the lack of indigenous representation in Parliament, in the judicial system and in the business world. 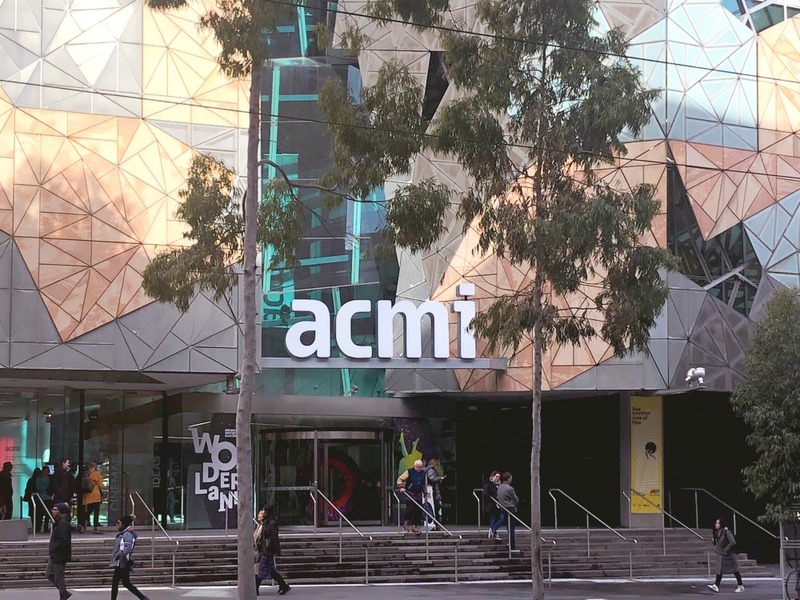 Then we head next door to the ACMI Museum. I’m very tempted by the Alice in Wonderland Exhibition and have heard great things about it but to be honest, there’s plenty to keep us occupied in the free TV and digital media exhibits. There are no pictures from inside because we are too busy playing the old skool arcade computer games. There’s nothing like a game of Space Invaders to bring on some technological nostalgia! The rain is coming thick and fast now and we’re in search of liquid refreshment so we head to Lustre Bar in busy Flinders Street. This cosy cocktail bar has a relaxed vibe and serves a spectacular spritz. I suspect with the crimson walls, cosy corners, ornate furniture and creative cocktails, this place comes in to it’s own at night although the balcony is a great spot for some laneway people watching during the day. 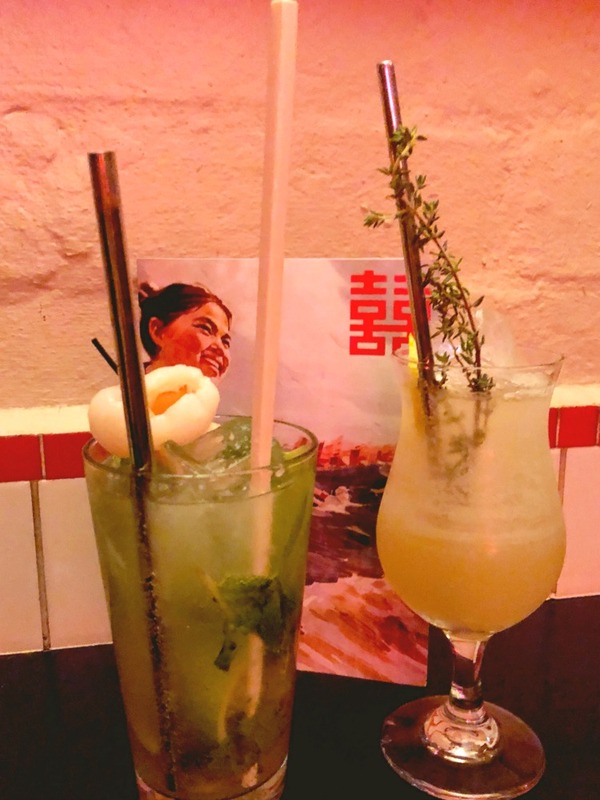 This trendy but cosy bar has a kitsch and fun feel with Chinese propaganda inspired decor and an Chinese influenced cocktail menu to match. Service is super friendly and the drinks are spot on. The drinks list is so much fun – David is very pleased with his Tong Collins – Japanese whisky, bitter aperitif, lemongrass, ginger and Chinese bitters – and I love the Great Leap Forward – lychee vodka, mint, lime and ginger beer. 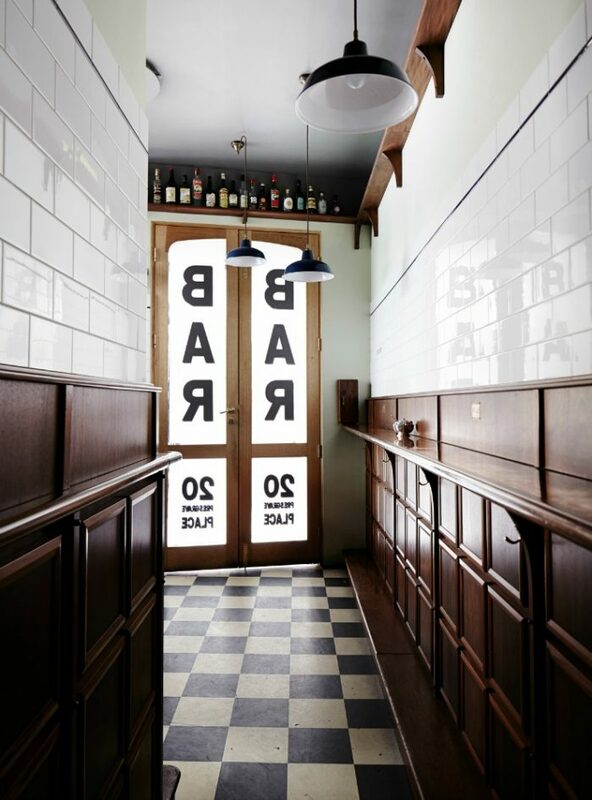 This quirky, split space laneway bar is worth seeking out. Finding this place is half the adventure, nestled in a laneway in the heart of Chinatown, we climb a few flights of stairs only to find a locked door and a doorbell. 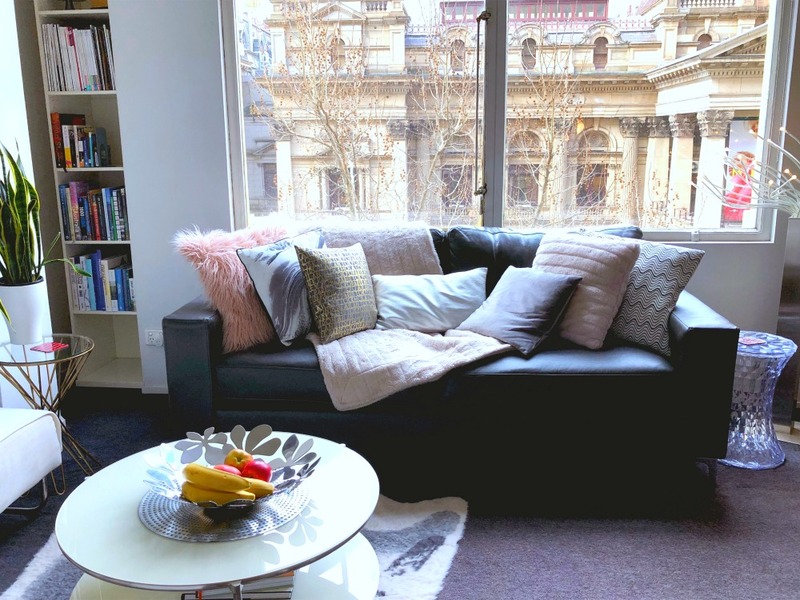 Someone comes to answer our call and invites us in to this Melbourne treasure where East meets West – I totally feel like an extra on Counterpart – have you ever seen that show? If not, you should, it’s totally terrific TV. Anyhoo, I digress. 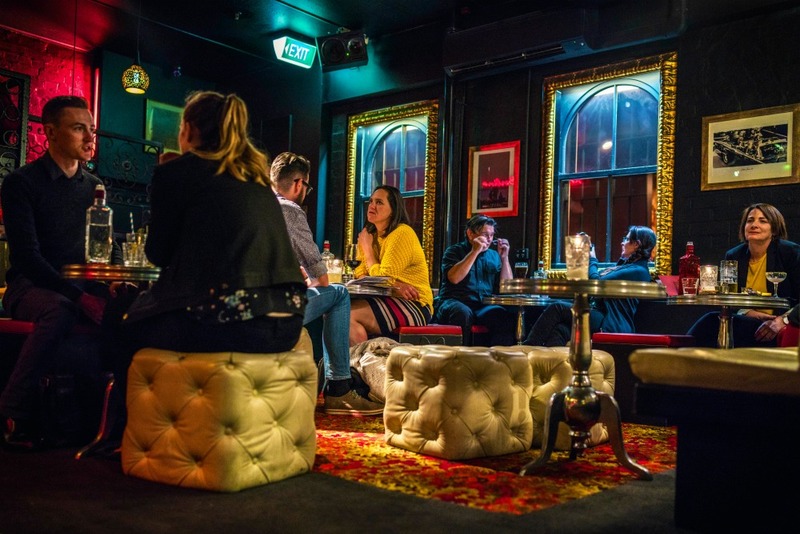 Our server asks us if we want to sit in the east – think bunker style decor and bathtub tables – or the west – plush banquettes, chandeliers and all out opulence. I’ve watched enough episodes of Counterpart to know west is best! The cocktail list here is epic and it takes us a while to make our pick but it takes even longer for the drinks to arrive. Cocktails are the heroes here and cocktail craft is something that cannot be rushed. The cool surrounds, amazing drinks and toe tapping eighties soundtrack make me want to stay all night but alas, we have to rush off to our dinner reservation. Trying a new cuisine was one of my challenges on my first list of 101 Things to Do in 1001 Days and it’s a challenge I’m keen to revisit, until today, I’ve never had Armenian food. Have you? Truth be told, I’ve been a bit obsessed with Armenia and it’s culture since I recently found out about the Armeninan Genocide on this podcast. 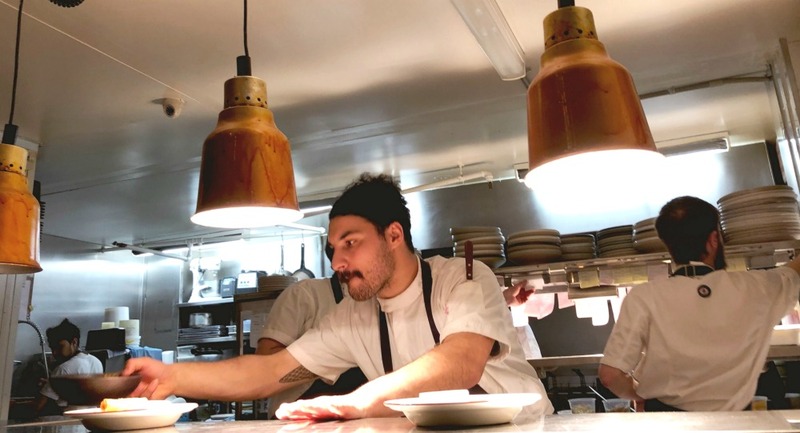 The restaurant was opened in 2013 by Chef Garen Maskal and cousins Aret & Sasoon Arzadian and the menu draws upon Armenian flavours with a modern Melbournian and contemporary twist. The restaurant is cosy and modern and the service attentive and friendly. We score a seat right in front of the kitchen so we can see the magic happen – the food looks crazy good and I am pleased to report that it tastes crazy good too! We don’t usually order a banquet or a set menu but as there’s only two of us and we want to try all the things, the banquet seems like the best option, not least because it includes baklava for dessert. 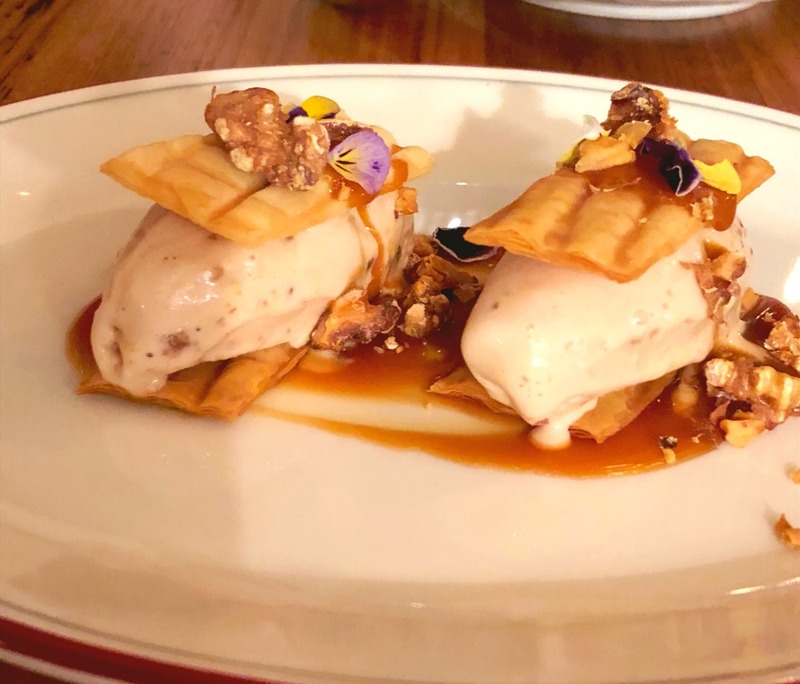 This New Style Baklava with walnut toffee ice cream and salted caramel sandwiched between sheets of crisp filo is all my dessert dreams come true. 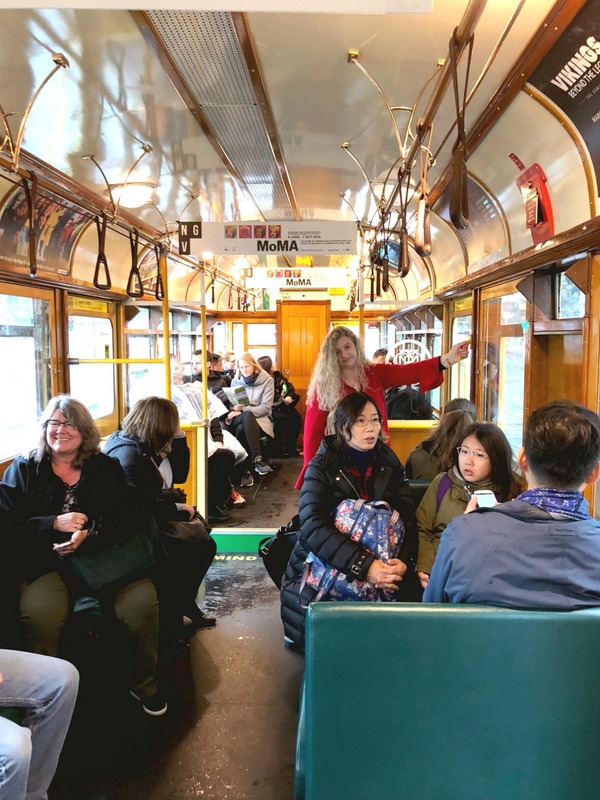 It’s raining kangaroos and koalas and we decide that the City Circle Tram is our best option – we can stay dry and still see a lot of the city. The city circle tram is free, aimed principally at tourists and runs in a circular route both clockwise and anti-clockwise. The trams run every 12 minutes but we are uber lucky because not only do we hop on a tram straight away but we score a seat too. We see so much of the city through the rain streaked windows and get our first up close look at the Docklands area. We contemplate hopping off and exploring on foot but it’s not a wise idea without a wetsuit! I love these vintage looking trams, they’re as delightful inside as they are out! The tram is a most pleasant diversion and a great way to keep dry but soon enough we have to think about food. I can’t live on tram rides alone! As we skipped breakfast, we decide on an early lunch instead and dumplings are always a good idea. 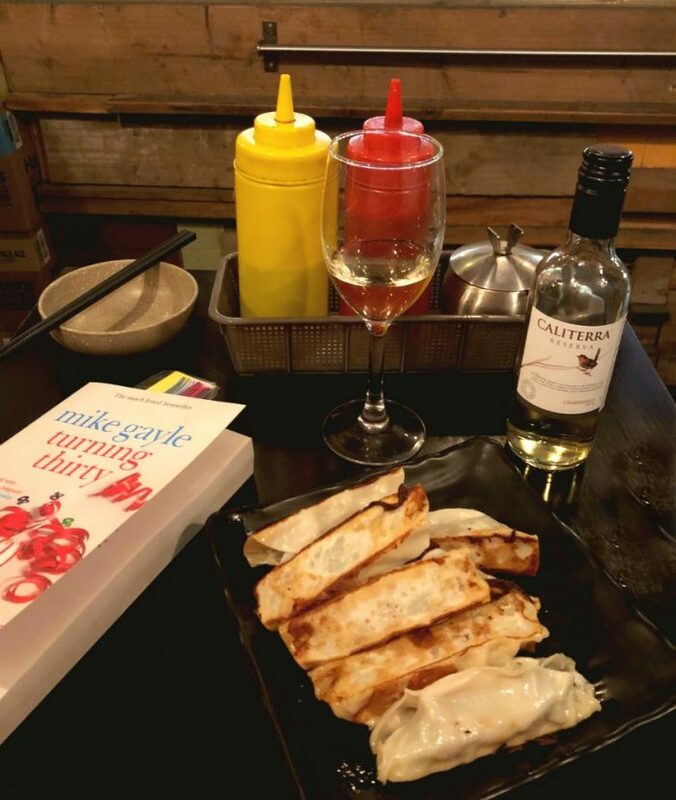 I find this situation most pleasing as I’ve been wanting to bring David to Hutong for dumplings since I discovered it on my last visit. We wait in line outside for the doors to open on the dot at 11.30am. It fills up fast so it’s always a good idea to arrive early or even better, book ahead. The Xiao Long Bao full of juicy pork and hot soup really hit the spot. I’m especially thrilled with the pot sticker situation here. 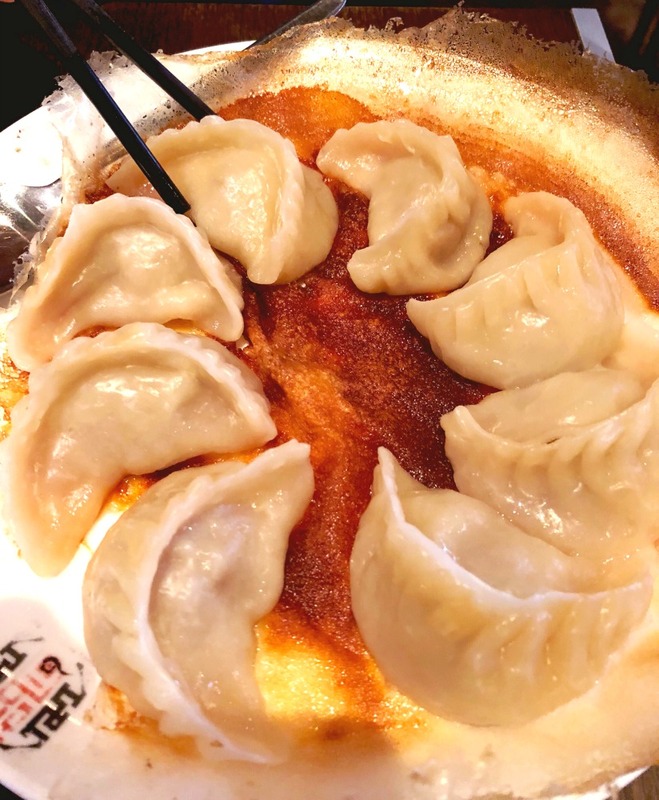 The dumplings are filled with a pork and soup combo, the bottoms are crispy as and they are presented served on this crispy pancake – which is made of flour and water. In case you’re wondering, we also order some green beans with chilli pork because we know how important it is to eat your greens! It’s a miracle that we’ve made it past noon without a coffee but we really need to rectify this situation. We are very pleased that this coffee shop is now open on Sundays and we’re not the only ones. 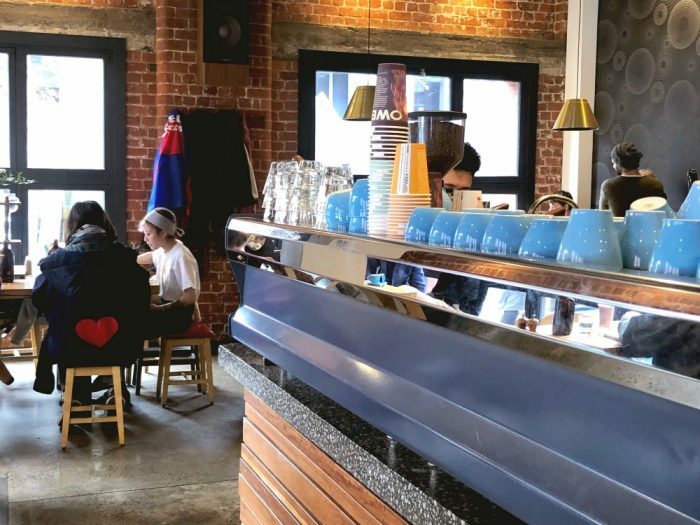 The tiny, quirky space is packed and when we taste the coffee, we see why. I can’t get a good picture but do look up and you’ll see a plethora of chairs hanging from the ceiling! 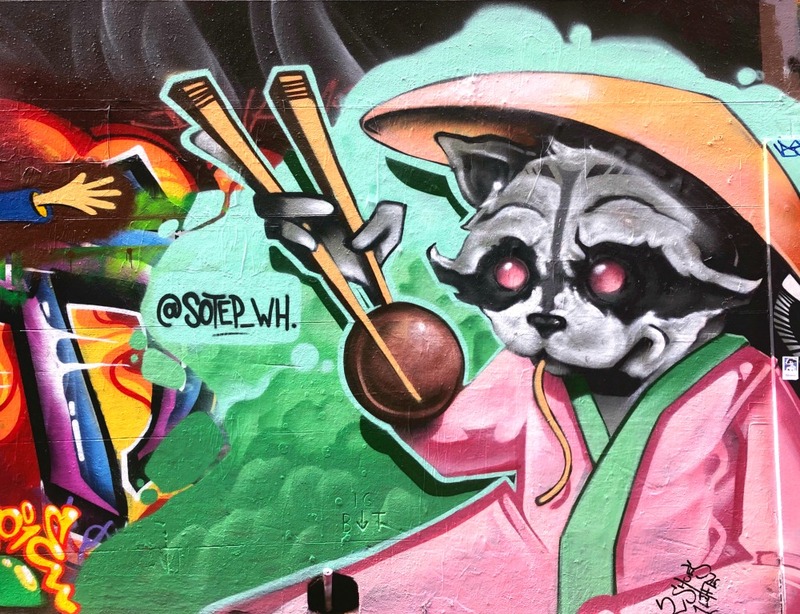 Melbourne has a reputation for being one of the street art capitals of the world. 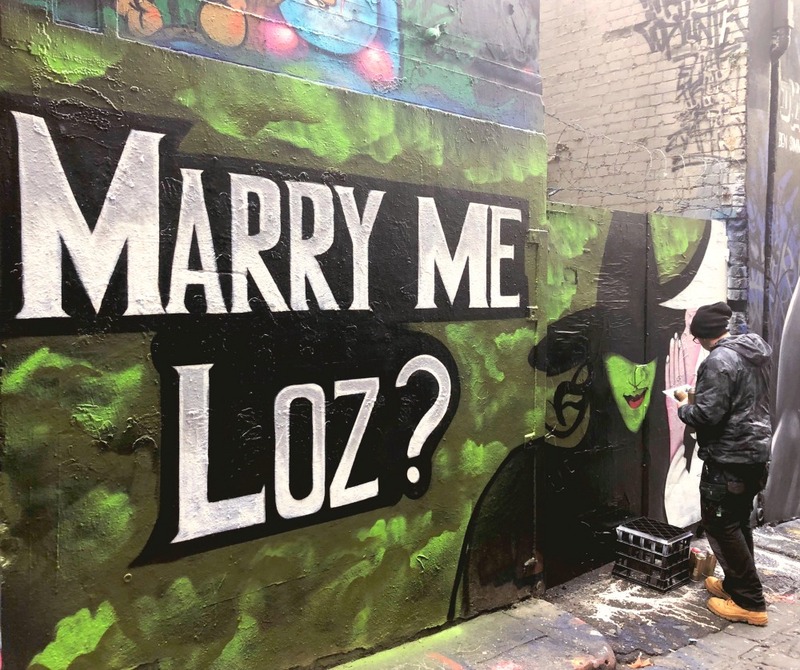 The laneways are like an outdoor urban gallery and we take advantage of the art on offer and stroll down some of the city’s most decorated laneways; Union Lane, Rutledge Lane and Presgrave Place. Hosier Lane is probably the most well-known and most visited, you can’t miss it for the crowds. We’re lucky enough to see an artist in action. I could stand and watch him all day. Unfortunately though, Sydney is calling and we have to head home. But first one last look at Flinders Street Station which is looking mighty fine after it’s recent facelift. We’re leaving with full bellies and happy hearts but there’s still so much I want to see, eat and do, so until next time Melbs! Because there will be a next time! 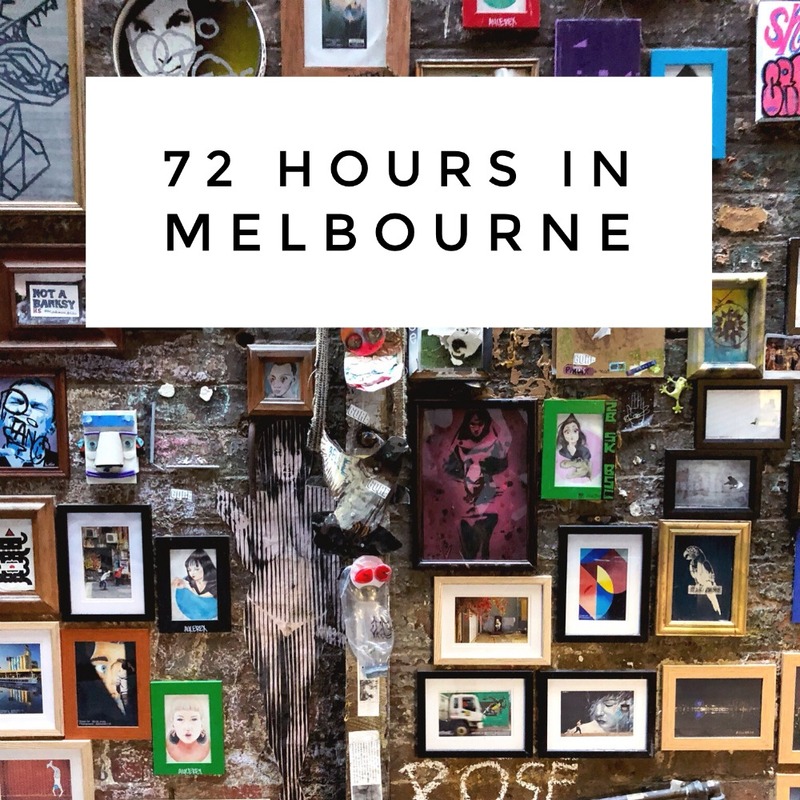 How would you spend 72 hours in Melbourne? Do you like to plan ahead or do you like to fly by the seat of your pants when you travel? 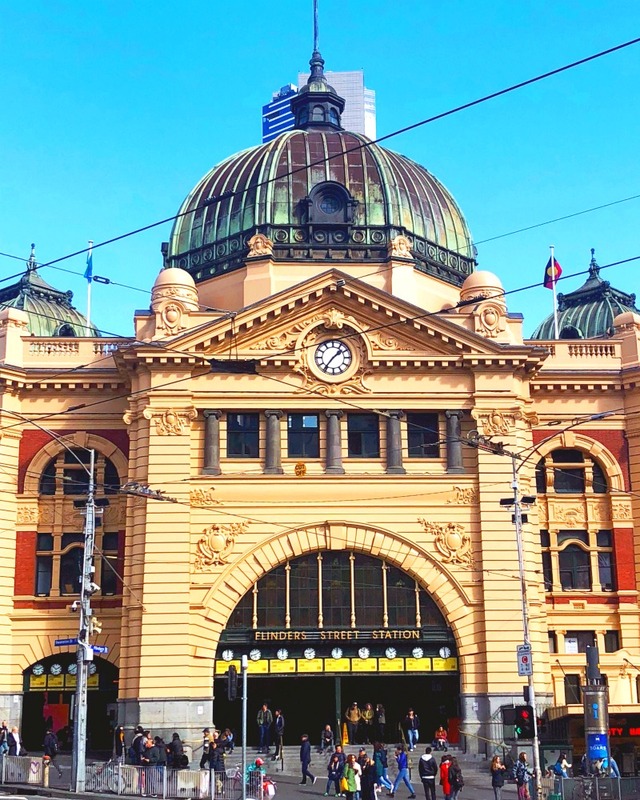 What shall I add to my Melbourne itinerary next time? We were both guests of Sugar Republic. All other tickets, food, drinks and accommodation were thoroughly enjoyed and independently paid for. As always, all opinions are honest and my own.